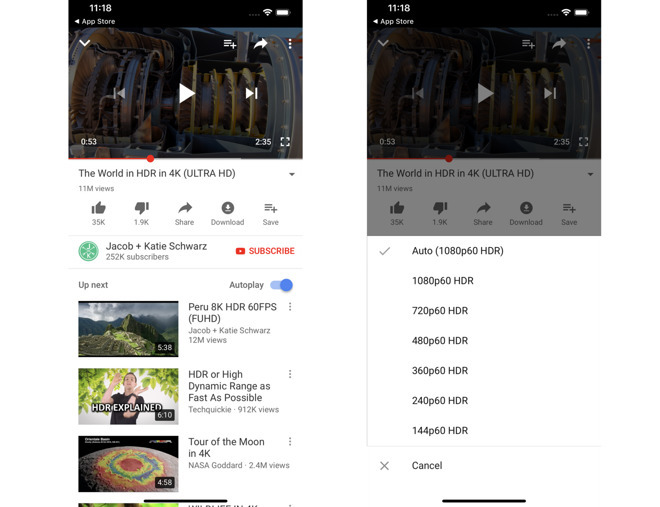 The update to version 13.37 of the iOS YouTube app adds new options to the video quality settings, with compatible clips now showing the letters "HDR" next to the resolution to denote the high dynamic range content. HDR options can be selected manually, but the Auto quality option will also enable HDR if it is available for the currently-viewed video. HDR enables for a wider range of colors in a video to be displayed on a compatible screen, such as is the case for the Apple TV 4K and a supported HDR-enabled 4K TV. The effect can allow for a brighter, detailed, and more vivid picture, with less color banding and other digital approximation artifacts. The OLED displays used in the iPhone XS and XR offer high contrast ratios, enabling it to be suitable to view HDR content, both created by the onboard cameras and those downloaded or streamed to the device through online services. The addition of HDR to the app for the XS range was not announced by YouTube. The release notes for the app version simply state it includes bug fixes and improved its performance, with no mention of additional device support for HDR. 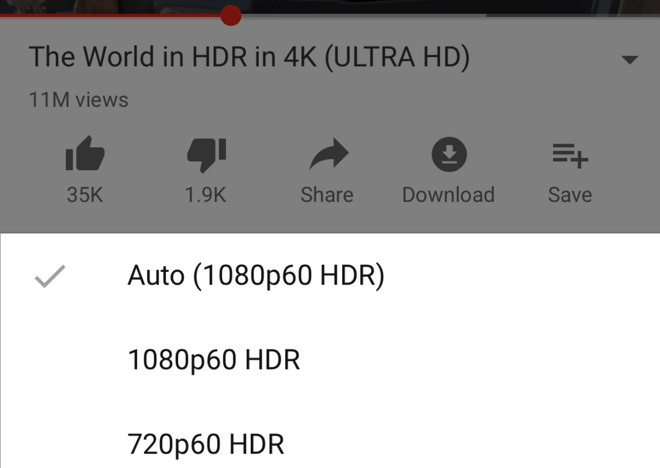 The YouTube app has had HDR support since May, specifically for the iPhone X, with the latest update extending that same support to the newer models. While HDR support is likely to be welcomed by users of those devices, the app continues to avoid providing any higher resolution options than 1080p, with 4K content displayed on the iPhones at a downsampled resolution. The problem is not only restricted to iPhones, as iPads with higher-resolution displays and the Apple TV 4K are unable to play 4K or higher-than-1080p content. The issue is also evident on macOS, as while Chrome can offer YouTube videos at up to 4K resolution, Safari is limited to only 1080p at most. The problem is likely to be down to Apple's lack of OS-level support for Google's VP9 codec, used by YouTube. While it remains unclear when or even if Apple will include VP9 support in its software and devices, it is also unknown if Google will work around Apple's decision not to use the codec in software as it has done on the Xbox One, if only to enable 4K or 1440p video streams on hardware that could play it.